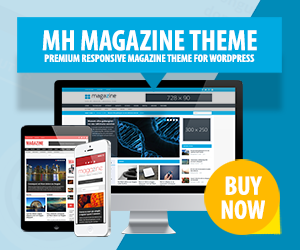 The MH Posts Focus widget is included in the popular MH Magazine theme and has been designed to display up to 5 posts with focus on one large post in the middle. This nice looking custom widget can be placed into any of the available widget areas and will appear differently based on the width and location of the particular widget areas. However, the MH Posts Focus widget mainly is supposed to be used in full-width widget areas to show its characteristic layout with one large post in the middle. This support article including video tutorial will help you use the MH Posts Focus widget correctly. You will learn how to control the content of the widget by filtering for categories or tags, selecting the post order based on different criteria or displaying the category name accordingly. First, you should place the MH Posts Focus widget into your preferred widget area on your front page. If you like, you can display a widget title and link this title to a specific location, e.g. suitable category or tag archive. Using the MH Posts Focus widget, you can present posts from one or more categories (enter category IDs) or filter posts by tags. For more information on how to look up the category ID, please see this article: How to find the WordPress category ID. When filtering posts based on tags, you simply need to enter your preferred tag slugs into the available field Filter Posts by Tags. To use this option correctly, please make sure you have tagged your articles properly. If you need some guidance about the difference between categories and tags in WordPress, please see this article: Difference between WordPress categories and tags. MH Posts Focus widget placed into full-width widget area on the static front page. There are a couple of more options within the MH Posts Focus widget, which you can take advantage of. For example you can display popular posts based on the number of comments by selecting Popular Posts for the Post Order option or display random posts by selecting Random Posts. The MH Posts Focus widget also provides an option which allows you to display the category name for each post you are showing within this widget. That option is especially helpful when you display posts from several different categories. In case you are showing posts from only one category and want to hide the category name, then you can also disable this with the particular widget option. In the video we’ve shown a few examples for the MH Posts Focus widget where you can see how you could use this widget in different widget areas. In the 1st example we placed the MH Posts Focus widget into the Home 1 full-width widget area on the front page. When placing the widget into a full-width widget area, you will get the characteristic layout of this widget with one large post shown prominently in the middle and four additional articles, two on each side. In the 2nd example we’ve placed the MH Posts Focus widget into a 2/3 width widget area. Doing so, the layout of the widget will display one large post on top and four additional posts just below. For the 3rd example we placed the widget into a 1/3 width widget area and thus you will see five posts with smaller thumbnails and excerpts just below each other. Have a look at the video and feel free to replicate the widget placements on your own website.